The likely election of socialist candidate François Hollande, with his plans to foster growth at the expense of the prescribed austerity, could set him on a collision course with EBC president Mario Draghi. François Hollande, the French socialist who looks set to win the second and final round of his countrys presidential election on Sunday, advocates remedies for the euro zone debt disease that differ sharply  and potentially dangerously  from the prescriptions of Mario Draghi, the fiscally conservative apostle of free market medicine who heads the European Central Bank (ECB). If Hollande wins, the divergent outlooks of these two men will become more than a topic of abstract debate: They could wreak fundamental change to the way the debt crisis unfolds. 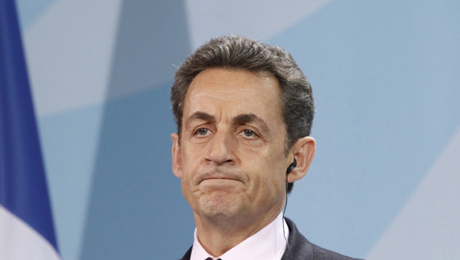 As each day passes, the chances grow slimmer that Nicolas Sarkozy, the center-right presidential incumbent and other half of the two-horse election race, will live up to his reputation as a political survivor by clinching victory through a sudden bold coup. 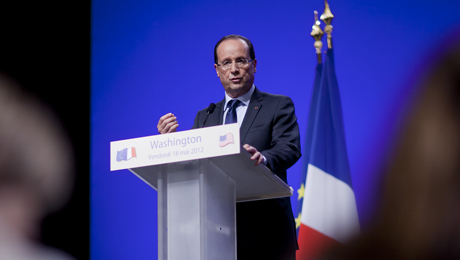 The latest polls put him about 7 or 8 percentage points behind Hollande. Sarkozy, Draghi and German Chancellor Angela Merkel have, against all odds, managed to remain in (occasionally fractious) political alliance since the euro zone crisis began: agreeing on the need for cutbacks in government spending and the injection of free-market reforms. At first sight, Hollande does not present a radical departure from this consensus. The presidential candidate has called for a broadening of the new EU fiscal treaty  which demands that member states balance their budgets  to include a growth pact. Draghi responded in April by proposing a growth compact for Europe. Not to be outdone, a day later Herman Van Rompuy, head of the European Council, a decision-making body for European premiers, canvassed the idea of an emergency summit of European leaders to discuss growth. The growth argument has gained respectability in recent weeks because of signs that a diet of pure austerity is not achieving its desired effect of calming institutional investors, nervous about whether member states can pay back their debt. Standard & Poors cut Spains debt rating by two notches to BBB+ last week, citing the damage to its fiscal position caused by a likely shrinkage of the economy this year and next. The ongoing contraction has been generated largely by savage government cuts in spending designed to restore confidence in its debt market. More broadly, recent numbers suggest the euro zone as a whole may have plunged back into recession, in part because of a reining in of government expenditure  raising fears about the debt sustainability of a broad swath of member states. Hollandes solution is a set of largely pan-euro zone policies designed to accelerate long-term growth. They include common European project bonds to fund spending on new technology and infrastructure as well as higher investment by the European Investment Bank, a vehicle for EU economic development policies. These and other Hollande proposals that will increase growth by boosting demand, including hiring more public-sector workers, will require extra government spending. Outwardly, Hollande does not plan a major change in Frances deficit-reduction policy in order to boost growth: He has vowed to close the fiscal gap completely by 2017, only a year later than Sarkozys pledge. A closer look at Hollandes mathematics, however, suggests his policies may not be compatible with this aim. His spending projects will be funded partly by a planned tax on financial transactions. But they also presume a strong bounce back in French output growth, in part because of his pro-growth policies. Private-sector economists are skeptical that his proposals are sufficiently radical to achieve this optimistic scenario  particularly given continued fiscal austerity and bank deleveraging. Some analysts think that Hollande knows his sums do not add up but does not care because he and his advisers believe  in common with opposition politicians in Greece, the U.K. and elsewhere  that a less punishing timetable for fiscal balance will save his home country from economic ruin. Many economists think a certain amount of stealthy fiscal slippage of this sort might be a good idea, at a time when austerity is biting huge chunks out of national income. But Mario Draghi is not one of them  judging, at least, by his monthly homilies on the need for fiscal rectitude, delivered after the ECBs latest monetary policy decision. These press conferences also reveal that his own vision of growth is based not on Hollandes dirigiste idea of government intervention, but on the laissez-faire principle of removing distortions that interfere with the rule of the free market. This is the language of economic theory. What it means in concrete terms was set out helpfully in the August letter from Draghi and Jean-Claude Trichet, his predecessor as ECB president, to the then Italian premier Silvio Berlusconi. The now notorious missive dictated Italys economic policy in an implicit quid pro quo for emergency buying of Italian bonds. They included the privatization of local public services, reforms of collective wage bargaining to enable more local agreements and a review of Italys strict rules on the hiring and firing of employees, which  according to critics  keep Italian employment low by making employers wary of taking on new people. 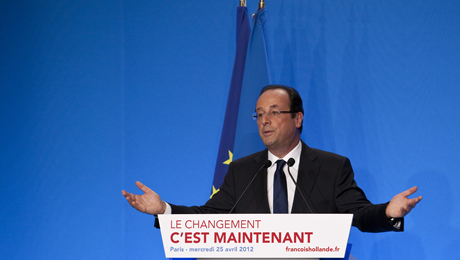 Several of the ECB bankers proposals are at odds with Hollandes platform. He wants to shore up the public sector, rather than radically downsizing it. Sarkozy has pledged to keep reforming Frances rigid labor market, but Hollande has made no major proposals for further change during his election campaign  instead promising to fight corporate job cuts. Moreover, the letter to Berlusconi included no mention of any hollandesque strategy of boosting growth through expensive government projects. At the moment, the bond market is relatively relaxed about Hollande. French 10-year bond yields remained little changed on the day after he won the first round on April 22. At 2.92 percent as the European market closed on Thursday, they are below the 3.09 percent level at which markets closed on the eve of the first round. However, the differences in approach between Hollande and Draghi are, in the longer term, vitally important. France is the euro zones second biggest economy, and Hollande has already shown that he wants to use this powerful position to make it the leader of a new grouping of countries that agree on the need for more emphatic growth strategies. If this makes France tolerate or even welcome some fiscal slippage, other member states may dare to relax their austerity too  potentially producing ripples of fear in debt markets, particularly in euro zone countries whose debt situation is worse than that of France. It may be that Draghi will be able to ignore the musings of this bloc for several months  limiting himself to the occasional coded criticism in press conferences. But if France or any other euro zone country comes to the ECB asking for emergency aid, he will have the power  as he did for Italy  to strike down any economic policies that meet his disapproval. These include hollandesque stratagems, in France or other euro zone member states, for growth based on government spending. Hollande will have to hope, therefore, that his growth pills will avert such a showdown  a highly public spat among the euro zones most powerful figures over Frances economic and fiscal policies could wreak major damage to its political system, economy and sovereign debt market.